Models folded and photographed by Michał Kosmulski. Modules designed by their respective authors. Click on images to enlarge them. Links in image titles lead to pages with more information about each particular object. Made from Sonobe module (12 modules). 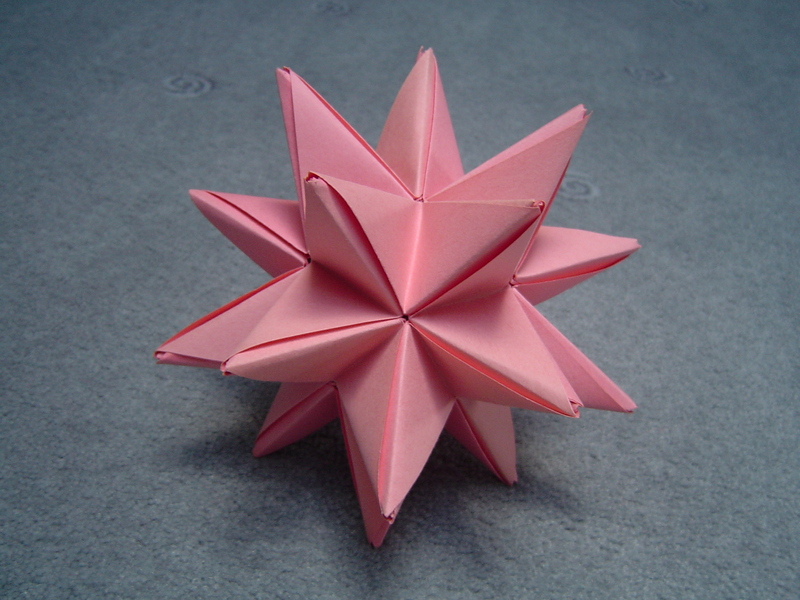 Made from Michał Kosmulski's Outdoor Origami Meeting Module (OOMM) (12 modules). Made from Michał Kosmulski's PVM (Pyramid Vertex Module) (14 modules: 8 vertex units and 6 connector units). Made from the sunken variant of Michał Kosmulski's PVM (Pyramid Vertex Module), inverted unit assembly (14 modules: 8 sunken vertex units and 6 connector units). 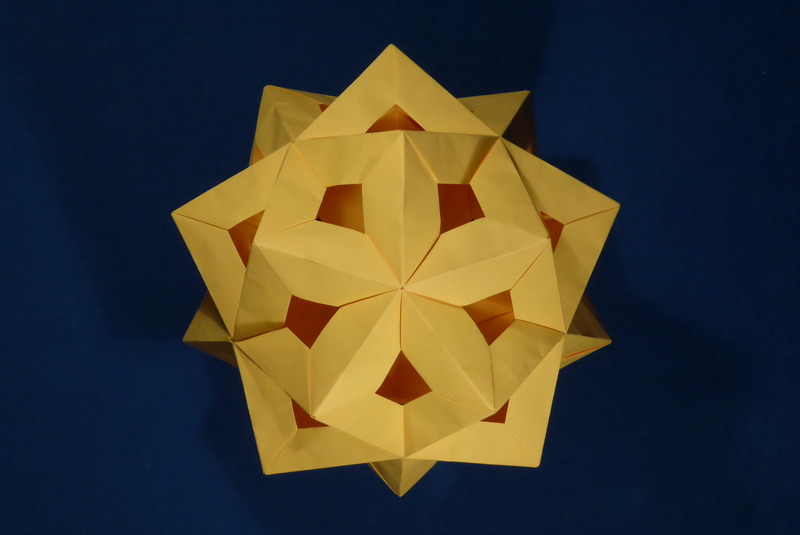 Made from Michał Kosmulski's Simple Edge Unit (SEU), Sonobe-like variant made of square paper (24 modules). This model demonstrates the rotated-link connection method. It requires twice as many units as regular Sonobe or SEU assembly, but each colored patch on the finished model can be a different color whereas in other connection methods, each colored patch shares its color with another adjacent patch. Made from Nick Robinson's trimodule (30 modules). Made from a variant of Sonobe module (30 modules). 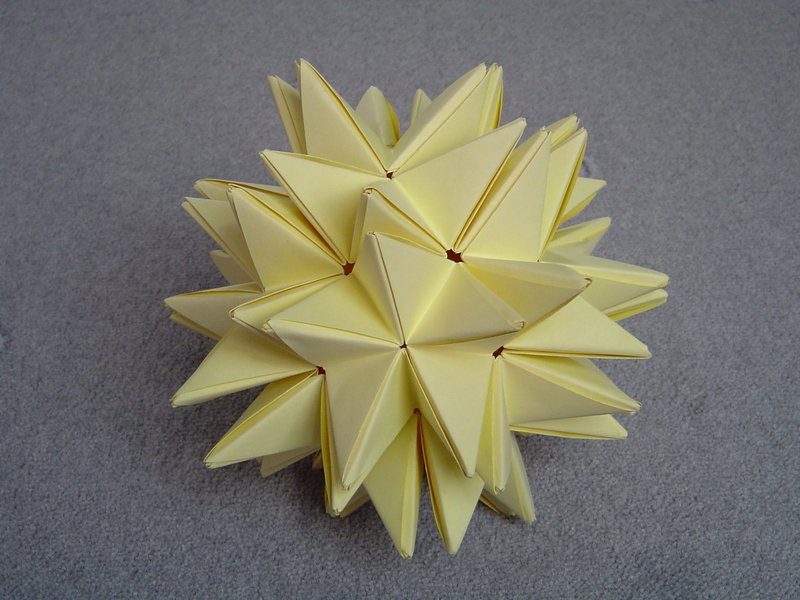 Made from Michał Kosmulski's Simple Edge Unit (SEU), Sonobe-like variant made of square paper (30 modules). This model demonstrates the SEU-link connection method: it is completely plain, without any decoration on the outside. This model demonstrates the reversed-SEU linking method: a single crease is the unit's only visible decoration. This model demonstrates the Sonobe-link connection method: the model is decorated with a pattern similar to the one found on models made from classical Sonobe unit. Made from Michał Kosmulski's Sturdy Edge Module (StEM) used as a face unit (30 modules). The unit is a variant of an edge unit; I call usage like this the “face variant” since the unit covers a face rather than an edge of the solid. 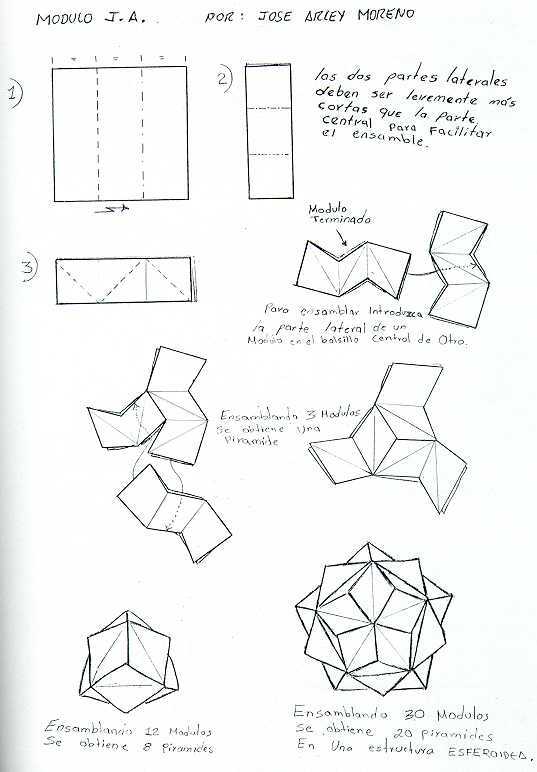 When I invented the module, I though it was very original, but soon I learned it was actually pretty common and had been independently designed by many others before (it’s just a variant of the classic Ow’s edge unit). 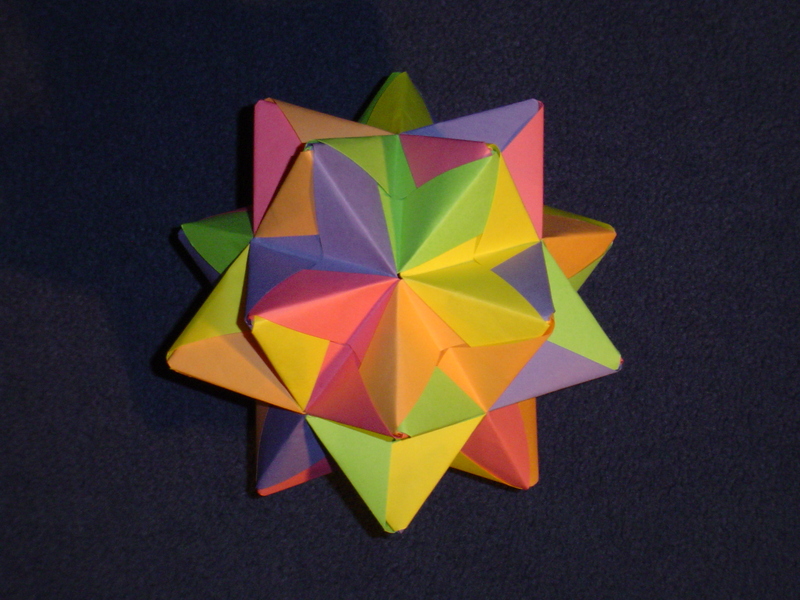 Dave Mitchell invented this “face configuration” (under the name Cube-Corner Star) as early as 1993. Made from Moreno's unit (30 modules). Originally I designed this as my custom unit, but later found out that it had been published before under the name of Moreno's Unit. 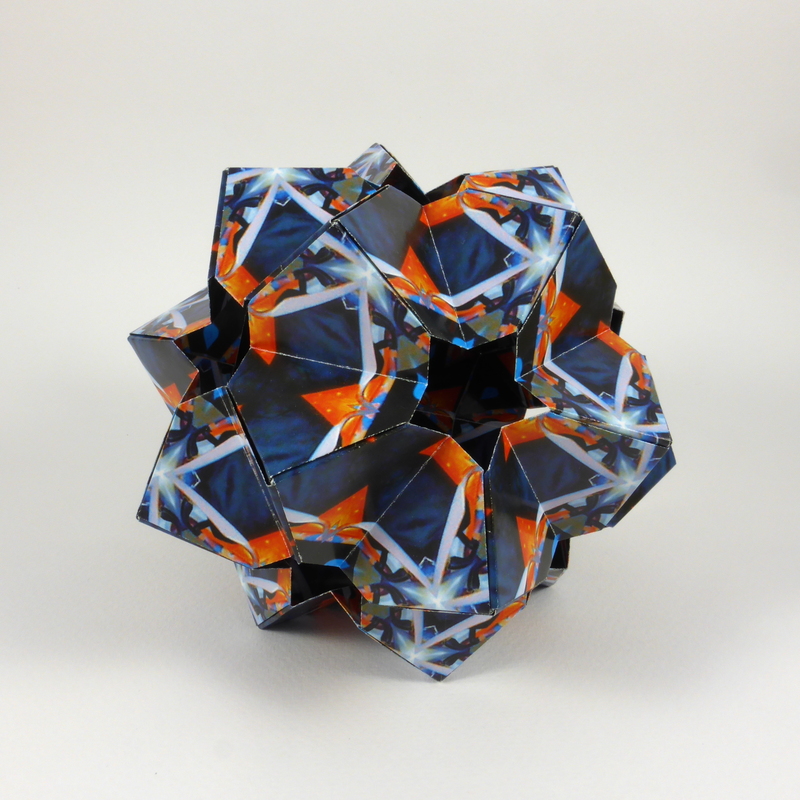 This model is actually a spiked icosahedron. 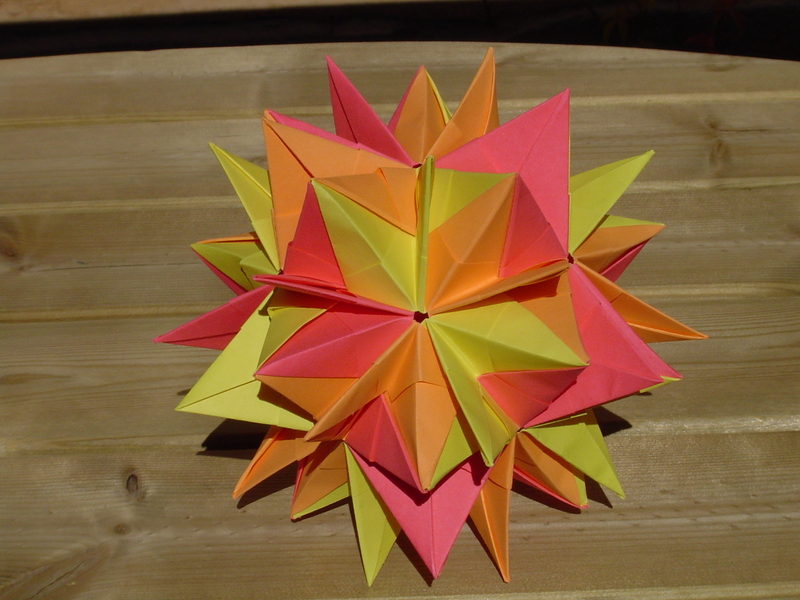 Made from Michał Kosmulski's Outdoor Origami Meeting Module (OOMM) (30 modules). Made from a modified version of Francis Ow's 60 degree module (scroll down the linked page for original unit folding instructions) (30 modules). Moved to Tangles and Woven Polyhedra. Made from M. Mukhopadhyay's cosmos ball module (30 modules). 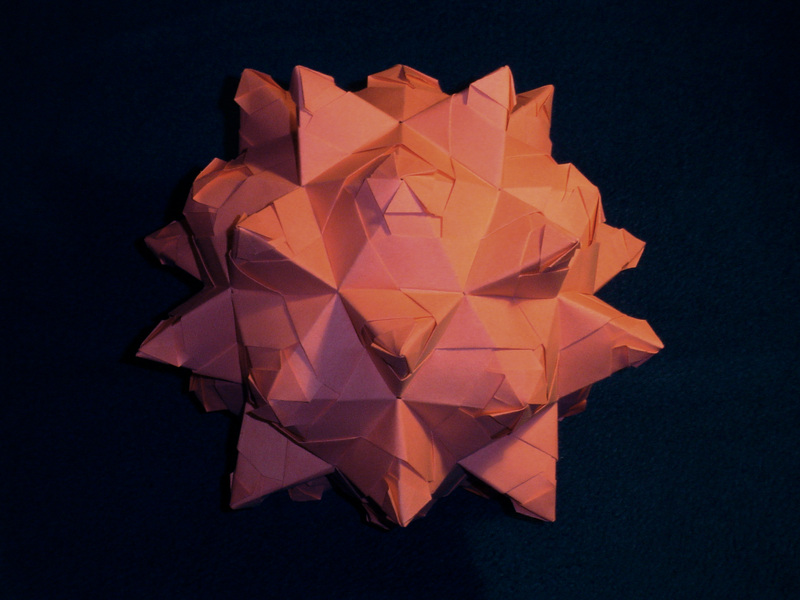 Made from modified M. Mukhopadhyay's umbrella dodecahedron module (30 modules). 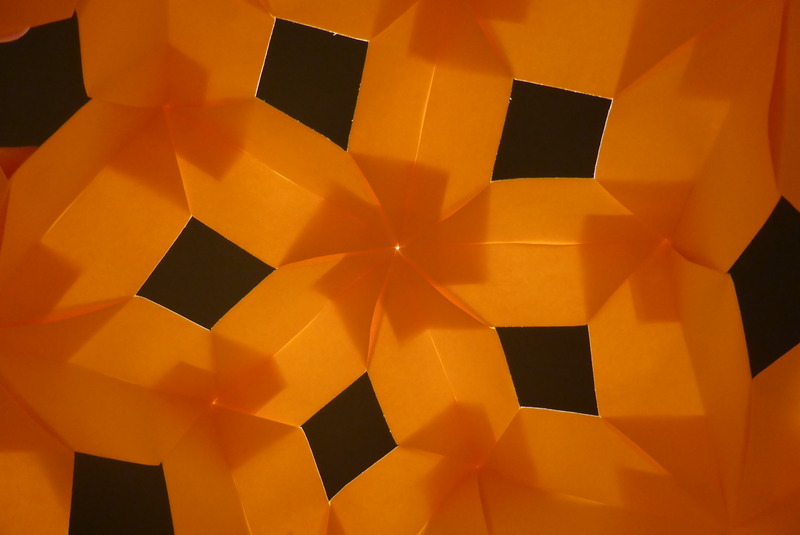 Made from M. Mukhopadhyay's super simple isosceles triangle module (module also attributed to Jeannine Mosely and Roberto Morassi) (30 modules). Made from Nick Robinson's trimodule (60 modules). 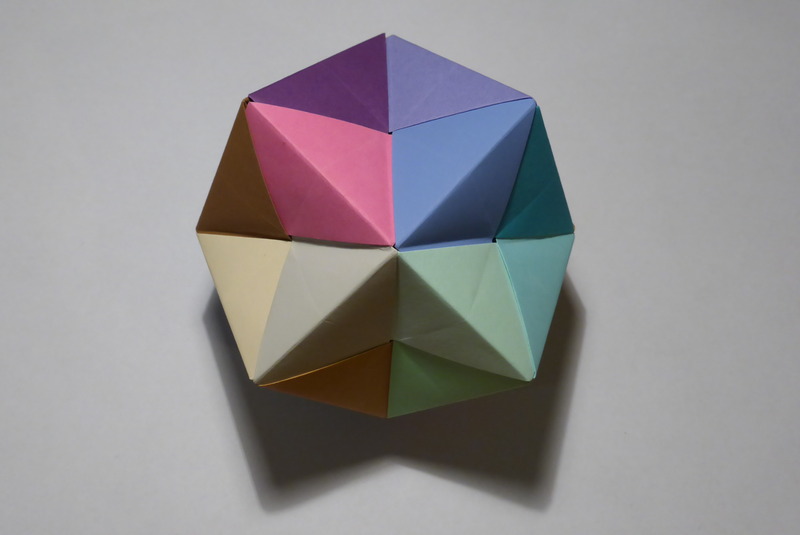 This is similar to the previous model, but apart from the spikes on all faces, the icosahedron also has "fins" placed on its edges. Made from Robert Neale's penultimate module (60 modules). 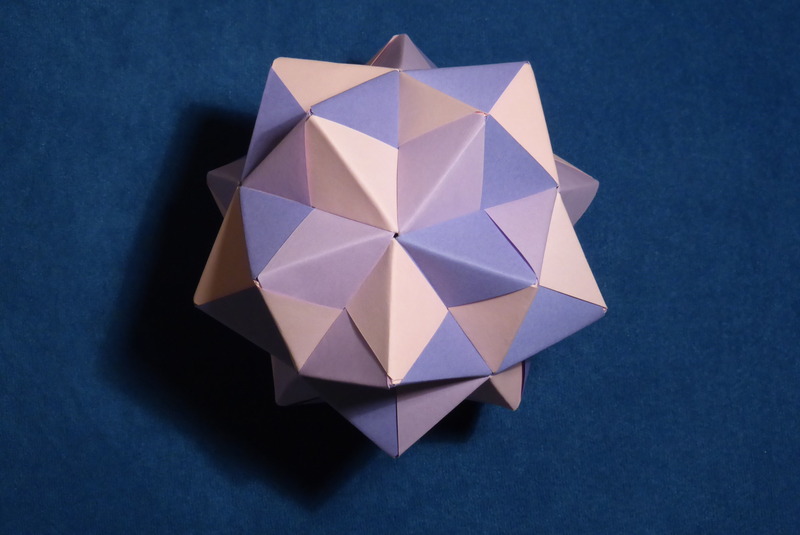 Made from Michał Kosmulski's Sturdy Edge Module (StEM) (60 modules). The second picture shows the interior of the model against a strong backlight, displaying how the modules are connected in an X-ray view. Made from Sonobe module (60 modules). 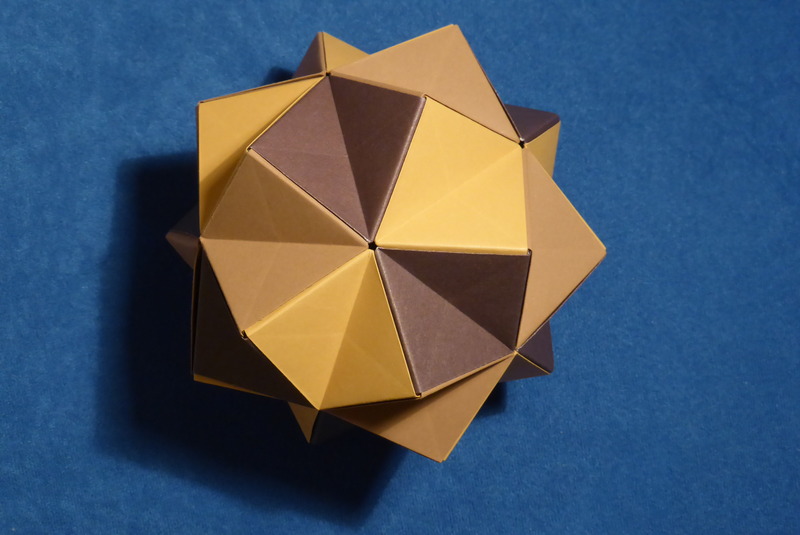 There is one spike placed over two adjacent faces of the pentakisdodecahedron in this model. I haven't checked if the angles actually add up, so it might be that this model can only exist because of imprecise folding. 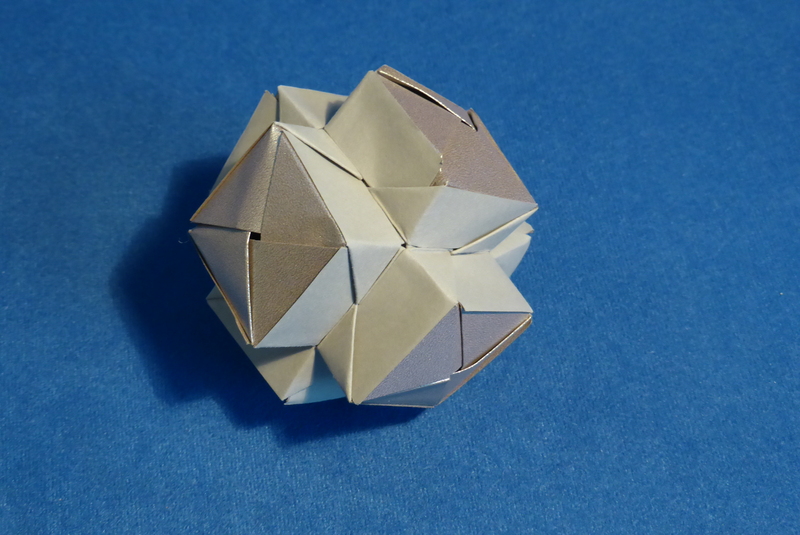 Made from Michał Kosmulski's Simple Edge Unit (SEU), Sonobe-like variant made of square paper (60 modules). Compare to the same solid made from another Sonobe variant (previous image on this page). Made from Charles Esseltine's TSU module (60 modules). Made from Tomoko Fuse's Little Turtle module (60 modules). 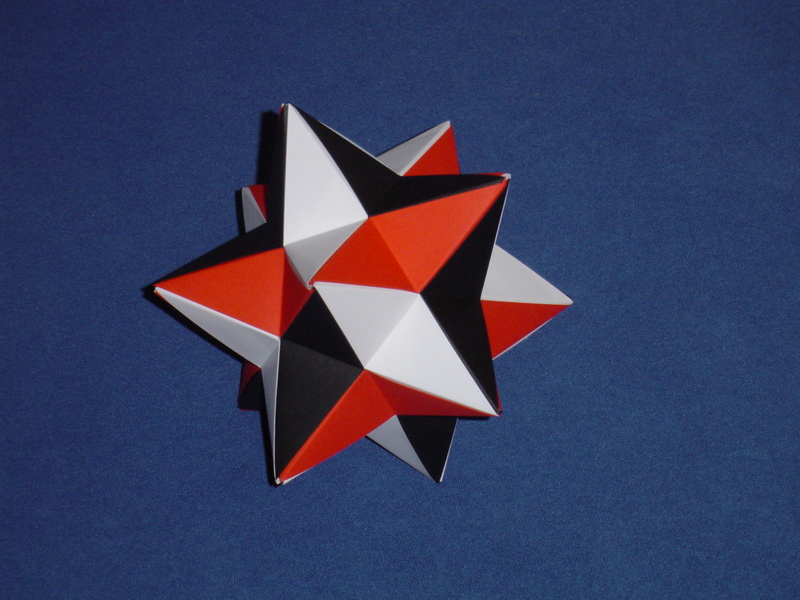 The structure of this model is similar to spiked icosahedra made with variants of the Sonobe unit and other similar modules. However, in the case of BBU a three-unit assembly is needed in place of each individual Sonobe unit, increasing the total number of units needed from 30 to 90. 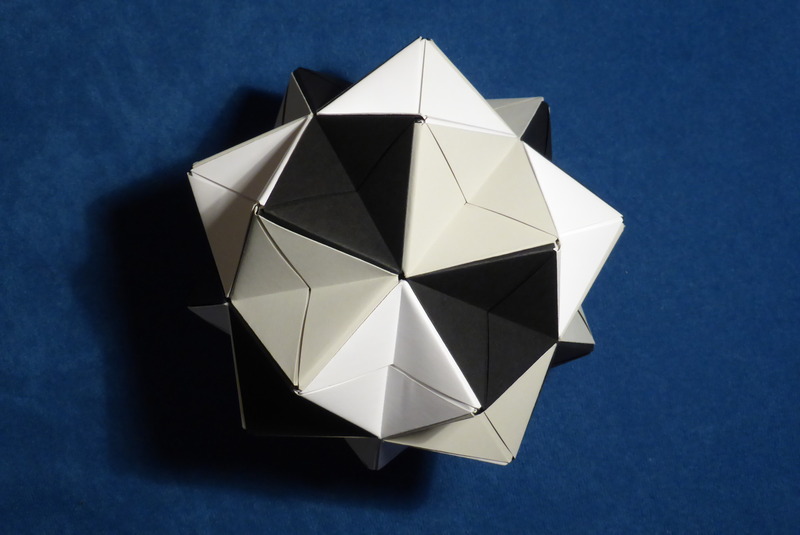 Made from Michał Kosmulski's BBU (Building Block Unit) (90 modules: 30 × D2, 30 × A2, 30 × A4). Made from M. Mukhopadhyay's super simple isosceles triangle module (module also attributed to Jeannine Mosely and Roberto Morassi) (90 modules). Made from Tomoko Fuse's Little Turtle module (120 modules). Made from M. Mukhopadhyay's super simple isosceles triangle module (module also attributed to Jeannine Mosely and Roberto Morassi) (120 modules). Made from M. Mukhopadhyay's super simple isosceles triangle module (module also attributed to Jeannine Mosely and Roberto Morassi) (180 modules). Made from modulo tornillo (210 modules).